Synthetic peptide within Human ErbB 3 aa 1300 to the C-terminus (C terminal). The exact sequence is proprietary. Our Abpromise guarantee covers the use of ab32121 in the following tested applications. WB 1/500 - 1/1000. Detects a band of approximately 185 kDa (predicted molecular weight: 149 kDa). Is unsuitable for ICC/IF,IHC or IP. Binds and is activated by neuregulins and NTAK. Defects in ERBB3 are the cause of lethal congenital contracture syndrome type 2 (LCCS2) [MIM:607598]; also called Israeli Bedouin multiple contracture syndrome type A. LCCS2 is an autosomal recessive neurogenic form of a neonatally lethal arthrogryposis that is associated with atrophy of the anterior horn of the spinal cord. The LCCS2 syndrome is characterized by multiple joint contractures, anterior horn atrophy in the spinal cord, and a unique feature of a markedly distended urinary bladder. The phenotype suggests a spinal cord neuropathic etiology. Overexpressed in a subset of human mammary tumors. The cytoplasmic part of the receptor may interact with the SH2 or SH3 domains of many signal-transducing proteins. Ligand-binding increases phosphorylation on tyrosine residues and promotes its association with the p85 subunit of phosphatidylinositol 3-kinase. Lanes 1 - 3: Merged signal (red and green). Green - ab32121 observed at 185 kDa. Red - loading control, ab9484, observed at 37 kDa. ab32121 was shown to specifically recognize ERBB3 in wild-type HAP1 cells along with additional cross-reactive bands. No band was observed when knock out samples were examined. Wild-type and ERBB3 knockout samples were subjected to SDS-PAGE. Ab32121 and ab18058 (Mouse anti Vinculin loading control) were incubated overnight at 4°C at 1/500 dilution and 1/20,000 dilution respectively. 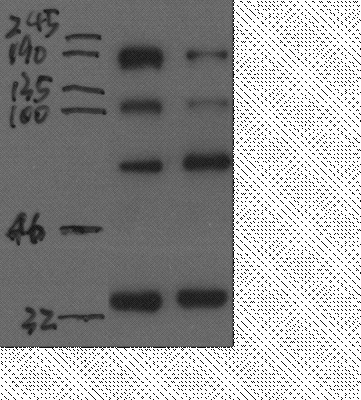 Blots were developed with Goat anti-Rabbit IgG H&L (IRDye® 800CW) preabsorbed (ab216773) and Goat anti-Mouse IgG H&L (IRDye® 680RD) preabsorbed (ab216776) secondary antibodies at 1/20,000 dilution for 1 hour at room temperature before imaging. Publishing research using ab32121? Please let us know so that we can cite the reference in this datasheet. Thank you for your enquiry. I have been in touch with the source of this antibody and I have discussed the problems that you have been having with them. They consider the approach that you are proposing a good idea. They also suggested inducing the expression of EGFR itself. They also recommended the use of A431 lysates as a good positive control. I hope this information helps, please do not hesitate to contact us if you need any more advice or information.